§ 38. BUT though our man of God was thus secluded from mankind, yet he did not cease from working miracles and curing those who were sick. For a venerable handmaid of Christ, Ælfled by name, who, amid the joys of virginity, devoted her motherly care and piety to several companies of Christ’s handmaids, and added to the lustre of her princely birth the brighter excellence of exalted virtue, was inspired with much love towards the holy man of God. About this time, as she afterwards told the reverend Herefrid, presbyter of the church of Lindisfarne, who related it to me, she was afflicted with a severe illness and suffered long, insomuch that she seemed almost at the gates of death. The physicians could do her no good, when, on a sudden, the divine grace worked within her, and she by degrees was saved from death, though not fully cured. The pain in her inside left her, the strength of her limbs returned, but the power of standing and walking was still denied her: for she could not support herself on her feet, nor move from place to place, save on all fours. Her sorrow was, therefore, great; and she never expected to recover from her weakness, for she had long abandoned all hope from the physicians. 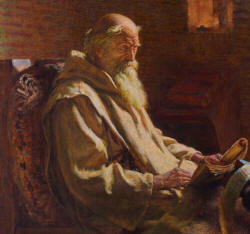 One day, as she was indulging her bitter thoughts, she turned her mind to the holy and tranquil life of the reverend father Cuthbert; and expressed a wish that she had in her possession some article that had belonged to him; “for I know, and am confident,” said she, “that I should soon be well.” Not long after this, there came a person who brought with him a linen girdle from Saint Cuthbert: she was overjoyed at the gift, and perceiving that Heaven had revealed to the saint her wish, she put it on, and the next morning found herself able to stand upon her feet. On the third day she was restored to perfect health. § 39. A few days after one of the virgins of the same monastery was taken ill with a violent pain in the head; and whilst the complaint became so much worse that she thought she should die, the venerable abbess went in to see her. Seeing her sorely afflicted, she brought the girdle of the man of God to her, and bound it round her head. The same day the pain in the head left her, and she laid up the girdle in her chest. The abbess wanted it again a few days after, but it could not be found either in the chest or any where else. It was at once perceived that Divine Providence had so ordered it, that the sanctity of the man of God might be established by these two miracles, and all occasion of doubting thereof be removed from the incredulous. For if the girdle had remained, all those who were sick would have gone to it, and whilst some of them would be unworthy of being cured, its efficacy to cure might have been denied; whereas, their own unworthiness would have been to blame. Wherefore, as I said before, Heaven so dealt forth its benevolence from on high, that when the faith of believers had been strengthened, all matter for detraction was forthwith removed from the malice of the unrighteous.